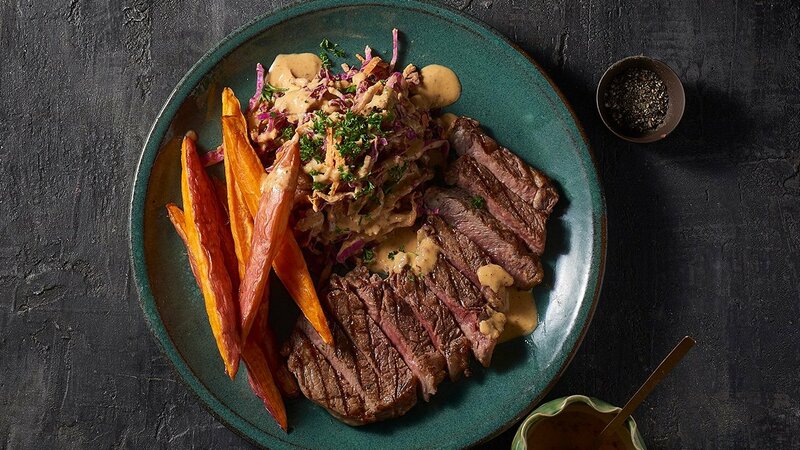 Nothing beats a well-seasoned and cooked scotch filet so accompany it with hummus combined slaw and sweet potato fries and you have an instant hit. Rinse and drain chickpeas, then place in a saucepan. Cover with cold water, then stir in bicarbonate of soda; this helps soften the chickpeas. Bring to the boil over high heat, then reduce heat to medium and simmer for 50 minutes or until tender. Drain chickpeas, reserving 125ml (1/2 cup) cooking liquid. Mix all ingredients together and use the hummus to combine. Lightly season Steak and seal on a hot grill or pan cook until desired. Cut Sweet potato into desired size wedges and cook in deep fryer at 190 degree Celsius for 8 minutes or until cooked through.